Bergamo's airport at Orio al Serio is the fourth busiest in Italy and there is no doubt that its rapid expansion has helped raise the profile of the city. Developed on the site of a military airfield, the airport welcomed its first commercial flight in 1972 but it was not until the deregulation of the aviation industry in the late 1990s that it began to grow at a significant rate. With the boom in regional and low-cost airlines that followed deregulation, Orio al Serio began to see passenger numbers increasing by significant numbers year on year. Around a million travellers used the airport in 2000; by 2014 the figure was 8.77 million, more than passed through Marco Polo airport in Venice. At first seen as a third airport for Milan -- hence it is often referred to as Milan Bergamo -- the airport has helped boost Bergamo's standing as an attraction in its own right, not least because its proximity to the city allows travellers to take in some wonderful views as they land, the Città Alta's beguiling charms often visible from the aircraft windows. Recently renamed Il Caravaggio International Airport - in honour of the artist who took his name from the town in Bergamo Province where he grew up -- the airport is situated just 3.7 kilometres (2.3 miles) to the south-east of the city. Currently you can fly to Caravaggio from more than 30 countries around Europe and North Africa. 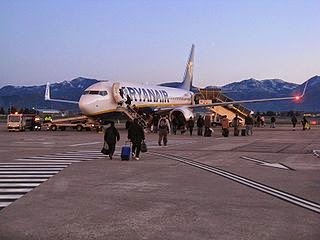 Ryanair has developed Bergamo as one of its major hubs and the majority of flights to the airport are operated by the Irish budget carrier. Visitors to Bergamo from the United Kingdom can fly with Ryanair from Bristol, East Midlands, London Stansted and Manchester. Flights from London Stansted account for around 375,000 passengers arriving in Bergamo each year. In addition to the UK, countries with direct flights to Bergamo are: Albania, Belgium, Bulgaria, Canary Islands, Czech Republic, Denmark, Egypt, Estonia, Finland, France, Germany, Greece, Hungary, Ireland, Italy, Latvia, Lithuania, Macedonia, Malta, Moldova, Morocco, Netherlands, Norway, Poland, Portugal, Romania, Russia, Slovakia, Spain, Sweden, Tunisia, Turkey and Ukraine. More details can be found in our Flights Guide which has been updated to show the spring and summer schedules.